As much as I would love to say that my children love their vegetables, this just isn’t the case. They are very healthy and adventurous eaters but when it comes to vegetables we do struggle a bit. It does get better with time and when I involve them in our choice of vegetable and cooking preparation. This recipe is a great side dish that they gobble up. 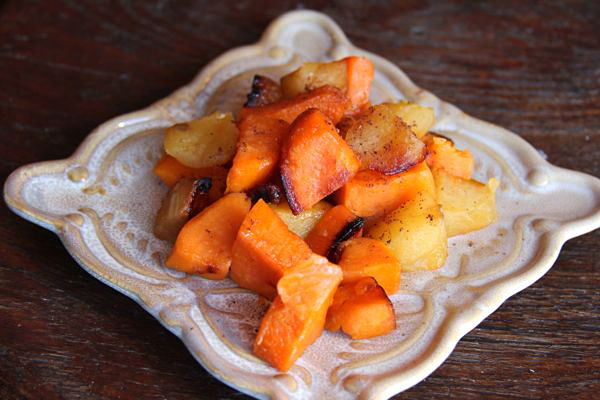 The apples lend sweetness and the maple syrup complements both the sweet potatoes and apples. Be sure to choose flavorful, sweet apples like Honeycrisp, Gala or even tart apples like Granny Smith. Apples are low in calories, a powerful source of antioxidants, including polyphenols, flavonoids, and vitamin C, as well as good source of fiber, and potassium. This recipe was changed from the original by decreasing the fat content through eliminating the addition of oil. The apples lend sweetness and the maple syrup complements both the sweet potatoes and apples. Preheat the oven to 425 degrees F, and prepare a 9x 13-inch baking dish by coating it with cooking spray. Cut sweet potatoes and apples into 1.5 inch chunks. Toss sweet potatoes, apples and syrup in the baking dish and roast, uncovered, for 40 minutes tossing once or twice during the cooking time. Remove from oven and sprinkle nutmeg over.